Small Breed is specially formulated to fulfill the nutritional needs of dogs weighing less than 20 pounds at maturity. Quality animal protein sources, such as chicken meal and whitefish meal, help build and maintain lean body mass. 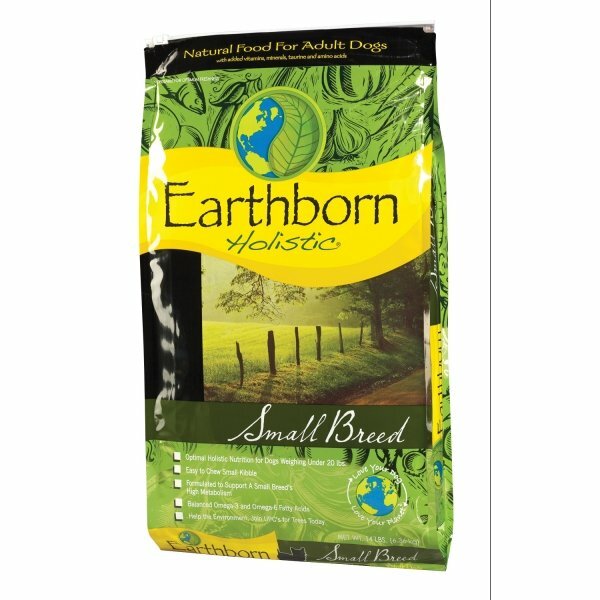 Earthborn Small Breed has different options and/or variations, please choose below. Small Breed is specially formulated to fulfill the nutritional needs of dogs weighing less than 20 pounds at maturity. Quality animal protein sources, such as chicken meal and whitefish meal, help build and maintain lean body mass while fueling your small breed dog’s high energy needs. The life expectancy of a small breed is up to 20 years, so he needs added nutritional support for his longer life. Antioxidant-rich fruits, vegetables, and minerals help meet his nutritional needs. Oatmeal, barley, brown rice, and rye are wholesome grains that are easily digested and are a good source of natural fiber, which maintains a healthy intestinal tract for your dog. L-carnitine helps convert body fat into muscle and energy, supporting lean muscle mass and body conditioning. Balanced Omega-6 and Omega-3 fatty acids play a vital role in establishing the lipid barrier of the skin, nourishing your dog’s skin. Those and other nutrients in Small Breed formula help replenish the skin and coats of small dogs, who may undergo a lot of handling by their owners. Made with our high-quality ingredients and processing technology, Small Breed provides excellent digestibility and nutrient absorption. Small Breed is 100% guaranteed for taste and nutrition for adult dogs.